Flu, Me? Public Remains Wary Of H1N1 Vaccine Despite the warnings of a pandemic of the H1N1 swine flu, less than half of Americans say they plan to receive the new vaccine. Health professionals are worried and shaping their message to change these skeptical minds, but it won't be easy. Nurse Colleen Goetzke administers the H1N1 vaccine to Jennifer Rose on Thursday at the Memorial Hospital of Burlington in Burlington, Wis. Fewer than half of Americans say that they are planning to receive the new H1N1 swine flu vaccine, according to recent polls — a trend that is leaving many health professionals at a loss. "I'm genuinely baffled," says Arthur Kellermann, an emergency medicine physician at the Emory University School of Medicine who has treated swine flu cases. "The public has developed this odd sense of complacency. The only thing that comes to my mind is photos of people standing on the seawall of Galveston hours before the hurricane hit." The public's skepticism over the vaccine has persisted despite health experts' warning that the unpredictable H1N1 virus, which can cause very severe complications even in healthy young adults and children, has reached pandemic proportions. The Centers for Disease Control and Prevention says an unusually high number of children have died since it first arose last spring. "There are now a total of 86 children under 18 who have died from the 2009 H1N1 influenza virus," the CDC's Dr. Anne Schuchat told reporters in a briefing Friday. Eleven of those deaths were reported in the past week, the CDC says. Public health officials and the medical community are scrambling to figure out how to convince more Americans to get vaccinated when supplies of the vaccine become more widely available, but it won't be easy. For one thing, there are many different reasons why people say they are unlikely to get vaccinated. Nearly a third are worried about side effects, according to a Harvard School of Public Health survey in September. Twenty-eight percent said they don't believe they are at risk for a serious case of the flu, while another quarter say they can get medication to treat the flu if they do get sick. That last statistic is the one that really worries Kellermann, who is also an associate dean for health policy at Emory's medical school. He says that even a mild flu outbreak could overwhelm the nation's emergency rooms, which already have a limited supply of the high-tech equipment that is needed to fight the most virulent cases of the H1N1 virus. "This flu, seemingly by random, occasionally picks out the healthy child or young adult and puts them in the intensive care unit, hanging on by a thread," he says. "We don't have thousands and thousands of ICU beds and high-frequency jet ventilators standing by to care for those people." For now, government officials are trying to walk a fine line with their message: They're touting the safety of the vaccine and warning about the risks of swine flu, but stopping well short of creating a panic. "They really can lose public credibility for decades if what they do is threaten that thousands are going to die and be hospitalized, and it doesn't occur," says Robert Blendon, a professor of health policy and political analysis at the Harvard University School of Health. "They feel confident there's going to an outbreak, but they don't know how many severe cases there will be." The swine flu vaccine is now being distributed in some places and is being targeted to those considered at high risk, including health care workers. Pregnant women and children are likely to be next. But the CDC says some deliveries of vaccine will be delayed because production is lower than expected. And officials do not want to create a panic. 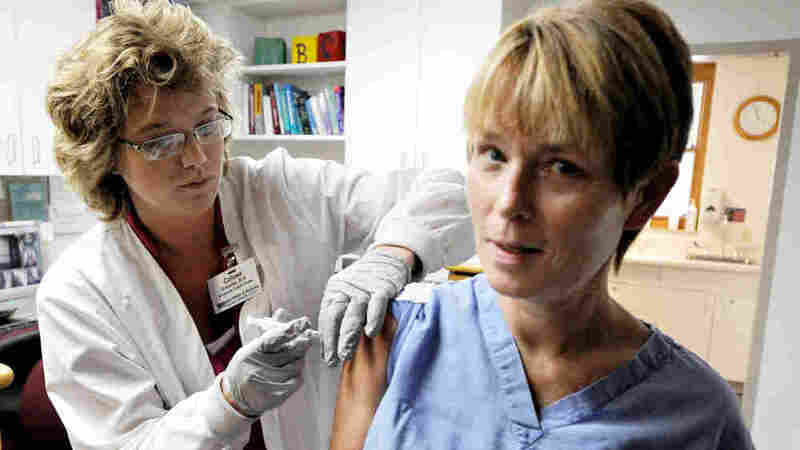 "There's too much at risk to try to use scare tactics to try to get people to vaccinate," says Kristine Sheedy, the communications director for the CDC's National Center for Immunization and Respiratory Diseases. "While we don't want to scare people into getting vaccinated, we also want to make the disease real." It is still very early in the fall flu season. As skeptics see more and more people getting vaccinated, experts expect others to change their minds. Reports of swine flu deaths, particularly in people's own communities and schools, could end up being the most powerful motivator. But this year, officials are also fighting some high-profile counterweights to their message. First, an unusual set of high-profile personalities — including conservative media commentators like Rush Limbaugh and Glenn Beck, and more liberal ones like Bill Maher — is publicly opposing the vaccination effort. Their opposition appears to be part of the larger anti-government movement that has been vocal during the debate over the Obama administration's efforts to overhaul the nation's health care system. Beck told his viewers on Fox News that he would do "the exact opposite" of whatever the government recommends. Maher echoed that on his HBO talk show, saying, "I don't trust the government, especially with my health." It's not yet clear how persuasive their opinions will be. "There's no question that the anti-government feeling and fears are playing a role," says Blendon. "We just don't know the magnitude of the impact." Public opinion surveys show that doctors and nurses are seen as the most credible sources of information on these kinds of medical decisions, but there has also been a flurry of media reports about some health professionals resisting mandatory vaccination campaigns at certain hospitals. "It is shocking to me when I hear a news story about nurses or doctors not getting vaccinated," says Kellermann, who says that he and his entire family will be vaccinated. "It is an issue of professional ethics. It's not just that I'm making decisions about my own health, but about my vulnerable patients. It's no different than washing your hands. It's part of my job." But the CDC's Sheedy says that doctors and nurses have always been tough sells when it comes to the flu. Vaccination rates for the seasonal flu have never topped 50 percent for health professionals — and usually hover barely above 40 percent. "We hear the same misperceptions among some providers as we do among the general public," she says. "It is quite a challenge for us to ask the public to go out and take this step and get vaccinated to protect themselves, when we have so many health care workers out there who aren't doing the same." Most professional medical organizations do recommend that their members be vaccinated. Some are planning information campaigns to encourage wider participation. The U.S. government is also starting to roll out its informational campaign. Part of the message will center on the safety of the H1N1 swine flu vaccine. "There is not an understanding that those of us in this business make influenza vaccines every year with different strains," says Sheedy. "It takes us about six months, and this one took us about six months. It is just another flu vaccine." Sheedy says that along with public service ads and flyers, the CDC is reaching out over social media sites such as Twitter to spread the message. "Does it feel good to have the flu?" she asks. "Do you like staying home in bed for two days feeling like you've been hit by a truck?"